No matter where we are in our spiritual development, we all have questions about our practice and what we are experiencing--both the challenges and opportunities. How can I overcome my struggles to meditate more deeply? Is there a need for a guru or can I rely on myself? Can I trust my intuition? Is it possible to hear the “Inner Word,” the voice of the soul, and how can I be sure that’s what I’m hearing? Is the Higher Self in the heart? 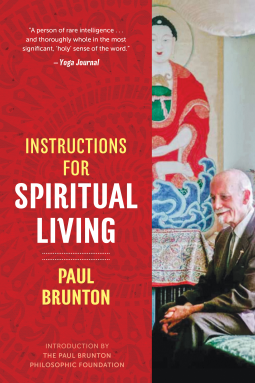 Offering trustworthy answers to these and many more questions, renowned spiritual teacher Paul Brunton provides instructions to guide one’s development in three fundamental areas of the spiritual path: meditation, self-examination, and the unfolding of awakening. Guiding you with insight and care through each stage of meditation, including advanced states that deepen one’s inner life, he explains how meditation is the art and practice of introverting attention, of freeing oneself for a period of time from thoughts, sensations, and feelings and allowing the soul to reveal itself out of the quiet that one has created. He explains the goal of each meditative stage and the obstacles you are likely to face and examines the need for spiritual dependency on any particular guru, teaching, or practice, showing that following your intuition can bring spiritual success. Exploring the process of self-examination and emotional purification, Brunton shows how life’s challenges are moments by which we can make real progress in our surrender to a higher life. He reveals how to break free from the ego, follow your intuition to align with your ideals, and tap into the inspiration flowing from within. He also examines the development of transcendental insight, the cornerstone of compassionate wisdom in action, which allows us to become a source of inspiration to all we encounter. Including writings received by the Paul Brunton Philosophic Foundation after his death, this guide offers transformative wisdom to aid our understanding of what the spiritual journey entails, help point the way when the way is uncertain, and learn and grow from the challenges that arise as you develop spiritually. The bulk of Brunton's book is on the ins and outs of meditation, but the topics I enjoyed most involved philosophy and mysticism. This would be a great book for anyone interested in alternative viewpoints, meditation, and self-improvement.